Dark Magical Orchestra by D. Brad Talton Jr.
"Empire--the Song of History. Who is Next to Rule the World?" Long ago, in an age of strange arts and arcane magic and dark secrets, there reigned over our world a single Lord, the Most Dark Emperor, whose line carried the fate of the earth in its hands for over three hundred years. A master of the myriad secrets of life and death, light and shadow, truth and lies, the Emperor and his descendants held sway over the continent of Europe and large portions of Asia with an iron hand. However, time renders all things to naught, and as day breaking from a long night, the dark age of the so-called “Renaissance Empire” was ended. The line of the Most Dark Emperor was destroyed, and his subjects scattered to the corners of the earth. As the victors over the Renaissance Empire slowly erased its existence from history, they left behind a single link, hidden away from the world–the last of a chain of direct descendants of the Imperial Line. In the sparsely populated recesses of Romania, the family Garidion–last true descendants of the Renaissance Empire–have lived for generations, cultivating their arts and magics, searching out allies, and preparing for the day when an Imperial heir will once more rule over the world. Dark Magical Orchestra has not been tagged yet. Help others find Dark Magical Orchestra by tagging it! 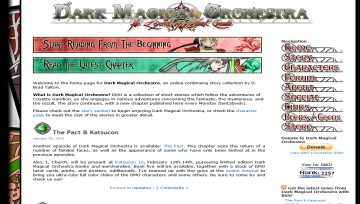 Dark Magical Orchestra has not been reviewed yet. Dark Magical Orchestra has not been recommended yet.